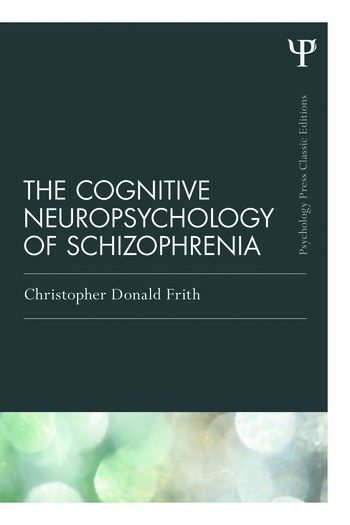 This is a classic edition of Christopher Frith’s award winning book on cognitive neuropsychology and schizophrenia, which now includes a new introduction from the author. The book explores the signs and symptoms of schizophrenia using the framework of cognitive neuropsychology, looking specifically at the cognitive abnormalities that underlie these symptoms. The book won the British Psychological Society book award in 1996, and is now widely seen as a classic in the field of brain disorders. The new introduction sees the author reflect on the influence of his research and the subsequent developments in the field, more than 20 years since the book was first published. Christopher D. Frith is Emeritus Professor at University College London, UK, Visiting Professor at Aarhus University, Denmark, and Quondam Fellow of All Souls College, University of Oxford, UK. In 2009 he was awarded the Fyssen Foundation Prize for his work on neuropsychology.